In My Happy Farm, becoming the best farmer means keeping your animals happy. 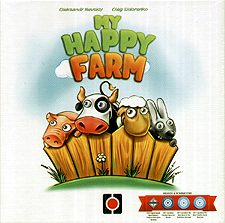 In My Happy Farm, you become a farmer who must buy seeds, plant them, watch them grow, and harvest the crops that feed your animals. Well-fed animals are happy and happy animals score points. At the end of the game, the farmer with the happiest animals wins.